Andrew Lee Creech, left, and Spencer Hamp in “Buzzer” at ACT. 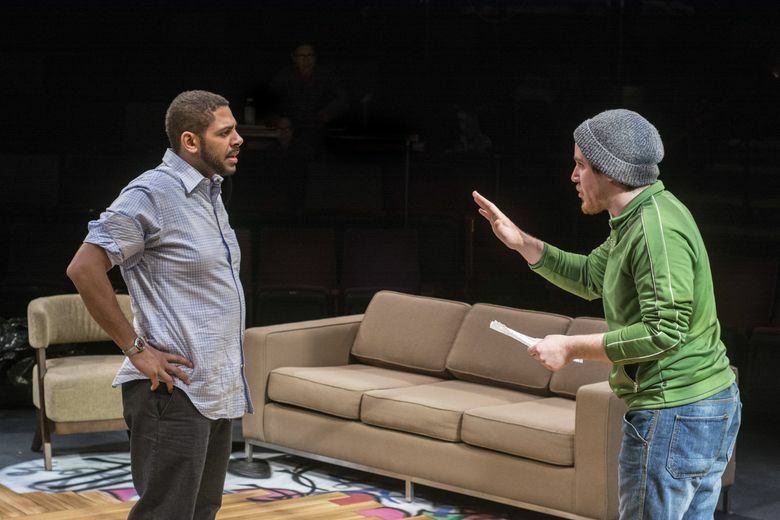 A review of “Buzzer,” on stage at ACT in Seattle through Feb. 21. Playwright Tracey Scott Wilson has loaded the play with thought-provoking issues. “You can’t go home again,” wrote Thomas Wolfe. Jackson, the successful, upwardly mobile African American at the center of “Buzzer,” now at ACT, should have paid attention to the great 20th-century novelist. Playwright Tracey Scott Wilson has loaded “Buzzer” with thought-provoking, timely issues — race and real estate among them — sprinkled with occasional humor. And on this stage, director Anita Montgomery gives intensity to this exploration of hubris and human weakness seen through racism’s lens. Jackson (played here with suave confidence by Andrew Lee Creech) grew up in the ghetto. His intellect and hard work brought him a Harvard Law degree and a successful career; he’s made it. His old neighborhood is changing, too, gradually gentrifying. What better move than to buy a new condo there and sit back while its value rises? By Tracey Scott Wilson. Through Feb. 21 at ACT, 700 Union St., Seattle; $20-$30 (206 292-7676 or www.acttheatre.org). Note: Several panel discussions about issues raised in the play are going on this month; see the theater website for details. Suzy, his white schoolteacher girlfriend, is played with sharp intelligence and impish charm by Chelsea LeValley. Suzy thinks that the junkies with whom they would share the neighborhood make it unsafe. Jackson, convinced that all will be well, dismisses her concerns. But why on earth would he invite Dan, his dear, but drug-addicted, white friend to move in with them? Spencer Hamp makes Dan a real charmer. Suzy rightly sees problems. How can Jackson assume Dan’s presence won’t affect their relationship? And what makes Jackson think that he, the rich lawyer, understands those mean streets better than his well-born but doped-up friend? Because of predictable interactions within the condo and the impact of the neighborhood pushers and addicts outside it, Jackson’s carefully structured world falls apart. It’s ironic that there’s a door buzzer to separate and protect the people in the condo from the street and its action — but the buzzer is broken. Some inconsistencies and an ending that doesn’t quite work are the play’s flaws. It is, however, powerful, and one leaves the theater with much to think about.